"This year has been an exceptionally hard year for me because of the hearings in the suit between the States relating to the Great Lakes and the Chicago diversion. At the request of the United States Supreme Court I am acting as Special Master in this suit and have just finished the taking of the testimony which has run up to ten thousand pages. The final argument is to be made before me at the end of May and at the beginning of June; then I must take up the case for decision. In addition, I have an important argument in Richmond just before the date of your Commencement and it would be physically impossible for me to attempt this year to make such an address as you desire. The important lawsuit that Hughes was handling for the Supreme Court involved the diversion of the waters of Lake Michigan to whisk away the sewage the City of Chicago. Many states sued Chicago for the diversion and states who benefited from the diversion joined on Chicago's side to defend the suit. A December 1927 Time Magazine article explains the background and result. Under a permit dated March 3, 1925, Illinois and its Chicago sanitary district have been drawing some 8,500 cubic feet of water per second from Lake Michigan, to flush away Chicago's sewage through a drainage canal emptying into the Des Plaines River which enters the Illinois River, which enters the Mississippi. Wisconsin, Minnesota, Michigan, Ohio, Pennsylvania and New York, complaining that Great Lakes levels were injuriously lowered by this leak at Chicago, sued to restrain Illinois in the U. S. Supreme Court. To Illinois' aid came Missouri, Kentucky, Tennessee, Louisiana, Mississippi and Arkansas. These co-defendants maintained that Mississippi Valley navigation had been benefited by the extra flow from Lake Michigan more than Great Lakes navigation had been hurt by it. The U. S. Supreme Court appointed its onetime member, Lawyer Charles Evans Hughes, to be Special Master in this suit, of which the ramifications affect Canada and U. S. foreign relations. Last week Special Master Hughes reported. Let the suit be dismissed, he said, for Illinois had done nothing illegal. The water diversion permit, which expires at the end of 1929, was properly issued by the Secretary of War who had been properly empowered by Congress, with which lies ultimate authority over national domain and waterways. Should Illinois overstep her legal permit, let the Great Lakes States then sue again. Before the permit expires and necessitates a fight in Congress, let Chicago perfect its water-purification so that diversion can be dispensed with; or let weirs be built in the Niagara and St. Glair Rivers to compensate the lake levels for such diversion as is continued. 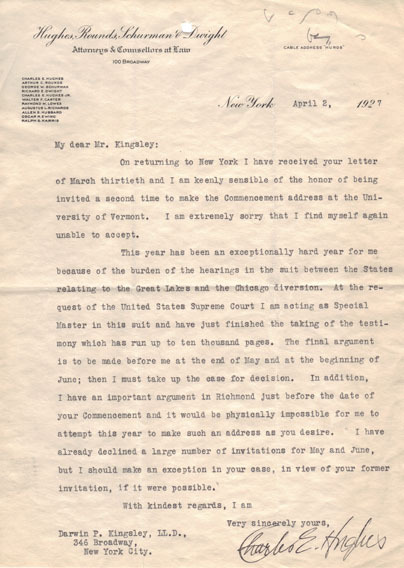 The letter comes with a nice provenance, a copy of a letter from the addressee of Hughes' letter two days later to the President of the University of Vermont transmitting the news that Hughes was unable to give the University's Commencement address. 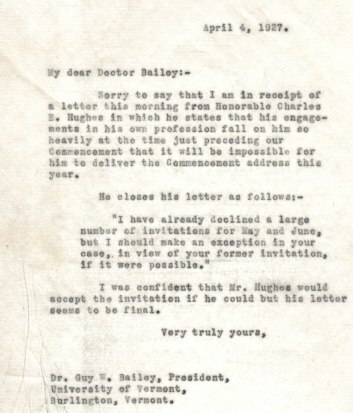 After our letter, Hughes would again be appointed to the Supreme Court by Herbert Hoover in 1930 to be Chief Justice and served for 11 years in that capacity. 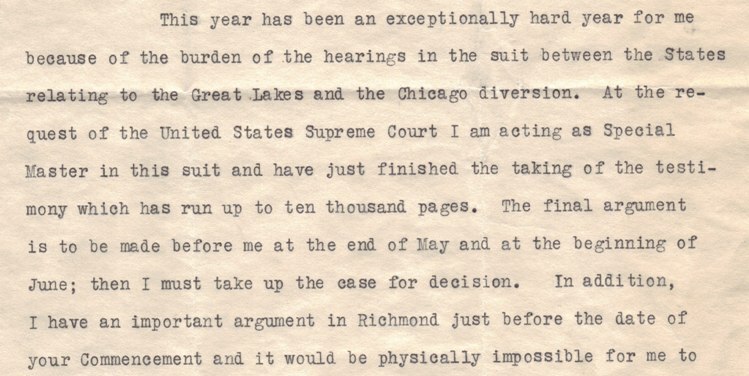 The letter shows the active legal life of Charles Evans Hughes between stints on the Supreme Court and provides a glimpse of legal and environmental history.